I awoke in the middle of the night last night unable to sleep. It was a little before 4:00 AM. I know what time it was because I looked on my phone since the power was out from the winter storm. Shockingly, I noticed from a few email messages, tweets and Facebook postings that the world lost a giant in the field of Jewish philanthropy. I only had the opportunity to meet Edgar Bronfman, Sr. twice and both were for only fleeting moments. At a Hillel staff conference in New Jersey he seemed to enjoy walking the hotel shmoozing with Hillel staffers and thanking us for our work on campus. It was he who should have been thanked. In the middle of the night I read his very lengthy obituary in the New York Times. As long as this tribute was it still failed to mention so many of the causes he championed and the philanthropic efforts he backed with his family's fortune. "Edgar was deeply committed to making Judaism relevant to all those who were seeking it. He sought to build a big tent, open for vigorous debate, impassioned questioning, and full of joy. He loved the energy and exuberance of young people, and took them quite seriously because he recognized that they would be the ones shaping their own Jewish future." Edgar Bronfman, Sr.'s philanthropic reach touched me in numerous ways. With Richard Joel, Bronfman reinvigorated Hillel: The Foundation for Jewish Life on Campus, creating a Jewish renaissance for Jewish college students. I was a college student and a Jewish leader at Michigan State University Hillel during these years when Mr. Bronfman would visit college campuses and share his vision of a more active Jewish center for students, one that focused on teaching leadership skills and being inclusive of all students. Later on, following rabbinical school, I worked as a campus rabbi and associate director at the University of Michigan Hillel Foundation and once again saw the benefits of Mr. Bronfman's philanthropy firsthand. A couple years later, as a congregational rabbi involved in the STAR Foundation's PEER program and STAR Synaplex Initiative, I once again was a beneficiary of his generosity as his foundation joined with the Schusterman Foundation and the Steinhardt Foundation to fund the STAR Foundation's programs that focused on transforming Jewish congregational life. Edgar Bronfman, Sr. reduced his involvement with Seagram as his devotion to Jewish causes grew. He became a major philanthropist through the family foundation, with a focus on Jewish educational and social programs in the United States and Israel. At New York University, he helped establish the Edgar M. Bronfman Center for Jewish Student Life. 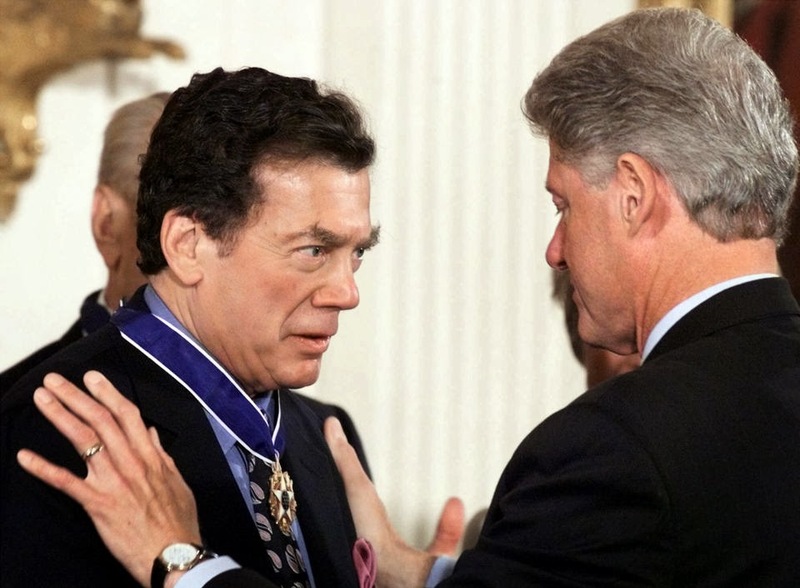 In 1999, President Bill Clinton presented him with the Presidential Medal of Freedom. Mr. Bronfman also wrote four autobiographical books. His work with the World Jewish Congress also accelerated. In the 1990s the Congress, spurred by Mr. Bronfman, negotiated with Eastern European countries to recover — or at least receive compensation for — the property of Jews that had been seized first by the Nazis and then by the Communists. In the late ’90s, the Congress became one of the foremost critics of Switzerland’s role during World War II, accusing Swiss banks of having stolen the deposits of European Jews who died during the war. After several years of bitter negotiations, Swiss banks agreed in 1999 to distribute at least $1.25 billion in compensation to relatives of European Jews who had secretly deposited their money in Switzerland before perishing at the Nazis’ hands. This past Spring I was asked to review Mr. Bronfman's Passover Haggadah which he created with his very talented wife, the artist Jan Aronson. I was happy to oblige and published a review of the Bronfman Haggadah on the Huffington Post website. What really struck me as I spent a couple hours reading through this masterpiece of a Haggadah was that this accomplished man in his mid-80s who built a family fortune in business, was in a league of his own when it came to philanthropy, and wrote several important books including autobiographies, decided that his work on this earth wouldn't be finished until he contributed his own Haggadah. It seems to me that this Haggadah was somehow meant to sum up his life's work for world Jewry. The story of the Exodus that we retell annually is symbolic of Edgar Bronfman, Sr.'s many decades as a champion for the Jewish people. In so many ways, he was our Moses of the 20th century. Yehi nishmato baruch -- may the memory of Edgar Bronfman, Sr. be for cherished blessings. Thank you for sharing this powerful Memory - to bless and guide and give courage . . .